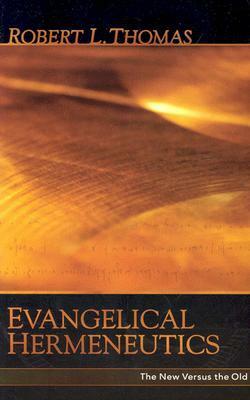 "Evangelical Hermeneutics: The New Versus the Old" by Robert L. Thomas delivers a well reasoned insistence upon retaining the "grammatical-historical" (pre-1970's) method of hermeneutics. Dr. Thomas analyses the landscape of many current theological, translational, linguistic, & cultural issues touched by the more recent and subjective "new" hermeneutic. This book carefully combs through terms that have become clouded by proponents of the "new" hermeneutic simply because many of them retained older terms but ascribed new definitions toward them. Helpful charts and summaries at the end of each chapter allows the reader a simple and straightforward review of the detailed analysis. And when I say detailed, I mean, detailed. It seems that each chapter has no less than about 50-100 footnotes (no joke). Which makes the e-book version upsetting because who ever formatted the ebook version didn't hyperlink the footnotes - - not to mention that on Kindle, this book isn't allowed to be on the loan program. Two strikes IMO for such a costly ebook. That being said, I am sure the printed page is the way to go for this extremely insightful book. Chapter 4 Dynamic Equivalence: A Method of Translation or a System of Hermeneutics? Chapter 17 Where Do Evangelicals Go from Here? (C) 2002 by Robert L. Thomas, Published by Kregel Publications. 528 pages of good reading.